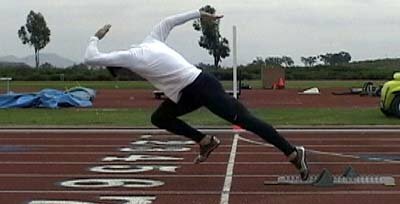 Improving Your Start For Sprinters! Having an effective start is a critical part of the short sprints. In this article, I will explain the start, exercises that will improve your start, and a variety of other technical aspects that go along with it. Having an effective start is a critical part of the short sprints. In this article, I will explain the start, exercises that will improve your start and a variety of other technical aspects that go along with it. First, I should explain that the start isn&apos;t the most important thing in a race, and it&apos;s not always going to determine who wins. For example, two years ago I thought my start was amazing. In fact, for around 40 meters there wasn&apos;t anyone, including Olympic medalists who could hang with me. Unfortunately, once I hit top speed, my poor sprint form never allowed me to transition this world-class start into efficient max-velocity mechanics. At about 55 meters, my toughest competitors would fly right by me! So even though I had the best start, I wasn&apos;t able to put it to good use and I&apos;ll explain why that happened later on. However, don&apos;t get me wrong; the start is important and that&apos;s why I&apos;m doing this article. For some of you, this article may be general; but for others, I&apos;m hoping this article will provide some useful tips and information that can be applied toward the progress you make. 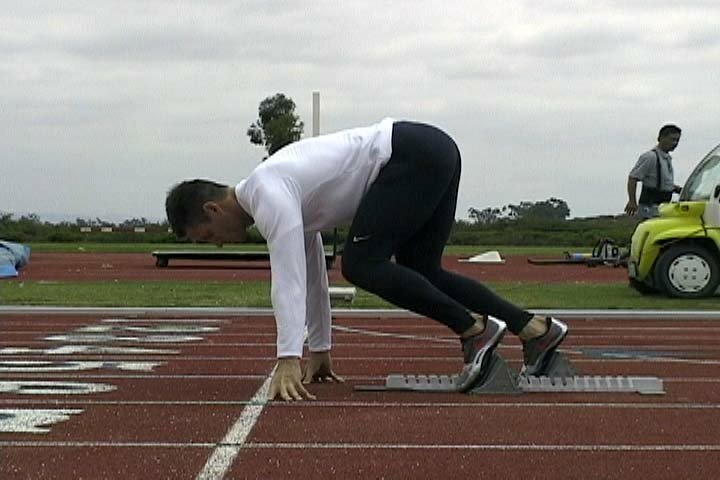 Before you back yourself into the starting blocks, you need to figure out which leg is dominant. The dominant leg&apos;s block pedal will be the one that&apos;s forward, and the other pedal will be placed slightly behind. An easy way to solve this dominant leg issue is to stand upright, cross your arms, clear your mind and then have a friend push you from behind. Make sure they push you when you&apos;re least expecting it. Whichever leg you use to catch yourself is considered "dominant." There are exceptions to this "dominant leg" rule. 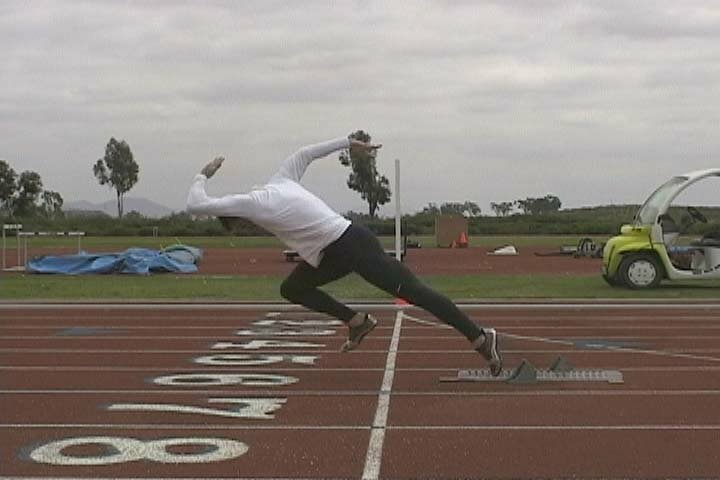 Some people choose to have their foot pedals perfectly even or just slightly separated ... an aggressive style that Ben Johnson used to get such a great start back in the 80&apos;s. This technique forces you to use both legs with an equal amount of force. Different strokes for different folks. Like I encourage in every article, you need to find what works best for you as an individual athlete. Once you have figured out the stagger of your block pedals, you&apos;ll need to position them in a way that will maximize your power while keeping your body aligned in the correct angles. The angle of your lead leg will be roughly 90 degrees, and the back leg will be around 120 degrees. 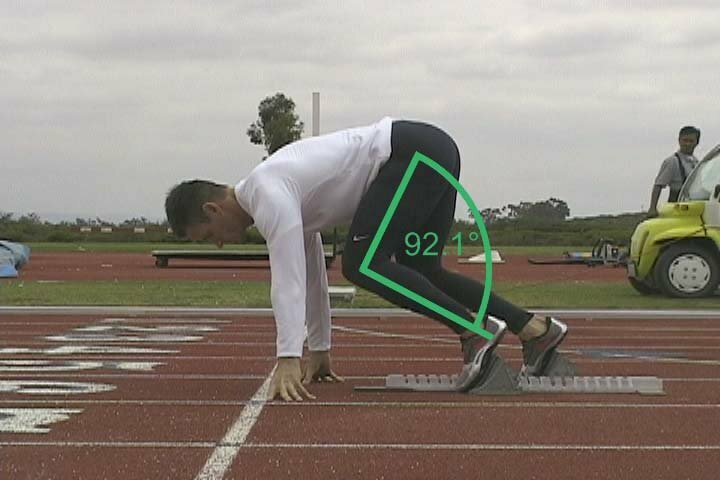 The degrees are measured by the angle of your thigh compared to the flat surface of the track. The angles may also vary slightly from person to person. To get an extremely rough estimate of this, put on your sprint spikes and go 2 foot-lengths from the start line to the front of the pedal. The other pedal will be approximately 3 foot-lengths from the start of the line. You can fine tune from there. Once you figure it out, it&apos;s important to be consistent with whatever this distance is. The slightest changes in your blocks can lead to variations in your start and drive phase. So unless there&apos;s a problem, keep things the same. Your hands must obviously be behind the start line. Trying to cheat this rule will lead to delays in the race. Most starters will normally see this and call for everyone to come up again plus single-you-out as the person who did it. The width of your hands is up to you and the philosophy of your coach. I personally have them slightly shoulder-width apart. I feel it&apos;s the best width for me to thrash my arms efficiently once the gun goes off. Having them too far apart or too close feels awkward. 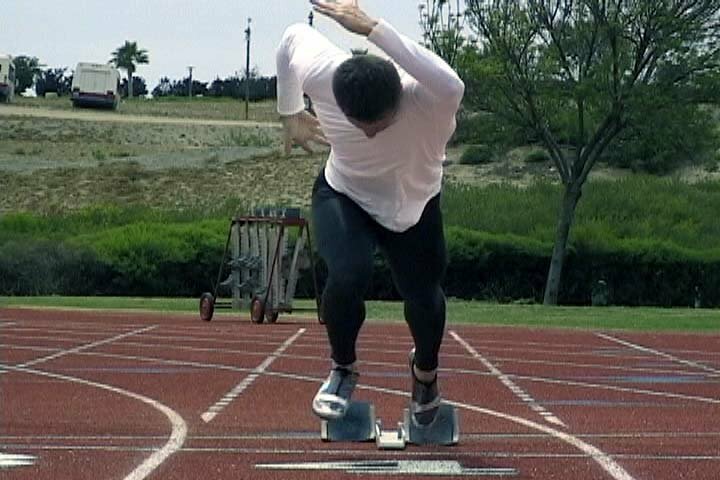 Being in the blocks isn&apos;t exactly the most comfortable thing to do but it&apos;s important to have every part of your body in a place to get the biggest bang for your buck ... whether it&apos;s your hand placement, the foot pedals or even the angle of your head. As I stated earlier, two years ago my start was ridiculously amazing! I shot out and was at top speed by 35 meters. This was because I had a short drive phase and I stood up early in the race, which made me change gears too fast. This ultimately made me run extremely tight for the last 50 meters. I have learned the hard way. It&apos;s crucial to stay down in your drive phase for at least the first 30-35 meters of a race. From 35 meters on, you will patiently begin transitioning into what&apos;s called the "max-velocity mechanics". These sprint mechanics will help efficiently carry you to the end of the race and beat the people who were running tight like I used to do. I don&apos;t have it perfected yet, but it&apos;s definitely improving! The point I&apos;m making is that you need to have a start that will allow you to keep accelerating toward the end of the race, not just for the first 35-40 meters. You shouldn&apos;t even be at max speed until around 50-60 meters. I was giving up better performances left and right just because I wasn&apos;t holding my drive phase long enough! Holding the drive phase angle is a weird feeling, but it&apos;s just something that practice will help you accomplish. While in the drive phase, it&apos;s also important to be accelerating your arms as aggressively as possible. The faster your arms move, the faster your legs will move. Whip them forward and drive them back! Exploding from a set of blocks is a violent, unnatural thing to do. It takes great overall strength, coordination, and agility to have an effective start. I&apos;m not saying go out and become a bodybuilding ballerina, but having a good strength-to-weight ratio with a sense of your body and what it&apos;s doing will make your life a lot easier. In my opinion, you can never be too strong, but you need to apply the strength toward a purpose. In this case, it&apos;s an incredibly fast, powerful purpose on top of implementing a full range of motion. It&apos;s a lot easier being short and jerky with movements, and that was my problem two years ago. Now I&apos;ve learned that starting with a full range of motion is not only just as effective, but it sets you up better to run faster and smoother as the race goes on. The following is a list of exercises and plyos that will help strengthen the muscles needed to have an effective start. During this time of the season, it&apos;s a little late to try and build too much more strength than you already have. This is simply because you don&apos;t want to tear yourself down to the point at which you&apos;re not sharp enough to run fast on the weekends. What&apos;s important now is teaching your body to explode quickly so use lighter weights. For these exercises, I&apos;m lifting no more than 60% of my max for sets and reps of 3x3. Remember, nothing you do in sprinting is slow, so don&apos;t perform these lifts slow. The focus here is on getting a full range of motion while being as quick and aggressive as possible. Pick out two or three of these exercises and add them into your regular routine twice a week. I will do these on Mondays and Wednesdays. Click Here For A Printable Log Of The Lifts Workout. Click Here For A Printable Log Of The Plyo Workout. What to do on each of these is an important part of your start. When the starter announces to everyone "On Your Marks," you need to do whatever it is you do to just become one with the moment. Shut out the entire world and focus simply on the task at hand. Then stimulate your Central Nervous System by jumping up and down a couple of times, slapping yourself in the face or whatever it takes! By this time, if you&apos;re not ready to go, it&apos;s too late anyway. Then back yourself into the blocks and load yourself exactly the way you&apos;ve done it in practice. In fact, you should have practiced this so much that it all just naturally flows into one movement. And when the starter yells, "SET", take in a deep breath and come up to the point at which your legs tell you there&apos;s optimal pressure … remember, listen to your body and only the gun. "BANG!" You will be exploding from the blocks like a rocket launching into space! Nothing is holding you back and you are just absolutely tearing up the track with a full range of motion and unbelievably quick power. Your arms should be ripping forward and backward as fast as you can tear them through the air. To be a sprinter at any level, you must have a well-developed reaction to the gun. And let me emphasize, reaction to the gun! Playing the guessing game with a starter is absolutely crazy. Throwing away all of your hard work to a false start is not worth the possible advantage that a millisecond might give you if you&apos;re lucky enough to time it right. Plus it&apos;s irritating to the other athletes! In practice, it&apos;s a great idea to have someone give the commands to you each time you do a start. For a gun, just get two pieces of wood and smack them together. And if you do happen to false start in practice, "reward" yourself with some pushups/sit-ups or whatever else you can come up with to discourage the behavior from happening again. My coach will make us run a 400 so, needless to say, we rarely screw this one up! I am striving to become a member of the 2004/2008 Olympic teams in the 100m dash and 4x100 relay and to threaten the current 100 meter world record!